Do you smell a rotten egg purtuding from a manhole or sewer line? In most cases, that odor is Hydrogen Sulfide, a toxic gas formed from septic conditions. 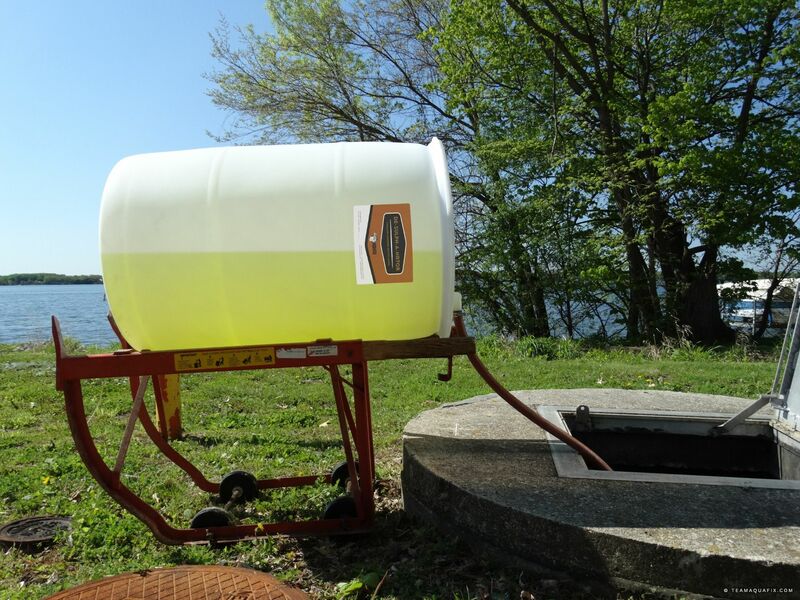 We treat everything from small grease traps to some of the world’s largest industries with tanks that emit toxic levels of sulfide with De-Sulph-A-Nator. 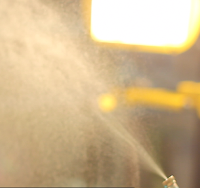 Hydrogen Sulfide (H2S) often is a colorless gas with a rotten egg odor, which is commonly referred to as ‘sewer gas’. Hydrogen Sulfide is highly poisonous and highly corrosive in wastewater applications. There are various problems associated with hydrogen sulfide generation, such as toxicity, noxious odors, and the generation of corrosive sulfuric acid. Decomposition of xanthates used in the mining industry (12). These sulfide-containing contaminants will either be oxidized (react with metals to form insoluble metal sulfides) or be released to the sewer (8, 13). When sewage becomes stagnant, H2S is generated in the anaerobic conditions. H2S can start to form sulfuric acid in lift stations and wastewater treatment plants, which will corrode cement and steel structures. 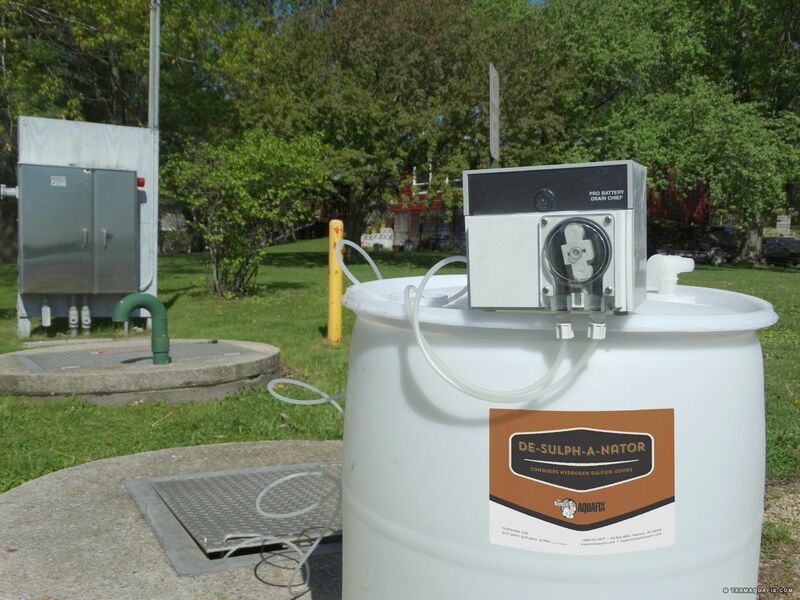 Our De-Sulph-A-Nator binds the sulfide and dissipate the odors over lift stations, wet wells, and sludge holding tanks, while OxyPaks XL disrupts the sulfur producing biofilm. The process of hydrogen sulfide generation depends on pH, temperature, and reactant concentrations (11). Hydrogen sulfide gas in the sewer atmosphere may be adsorbed in the thin film of water that normally covers the sewer walls and may be partially oxidized to sulfuric acid by bacteria of the genus Thiobacillus (8). Bacterial colonies and gas products are formed when bacteria in a wastewater system has favorable nutrient loadings and plenty of space above the water line. These bacterial colonies tend to lower the pH and cause Thiobacillus to oxidize the H2S and secrete sulfuric acid, causing corrosion. 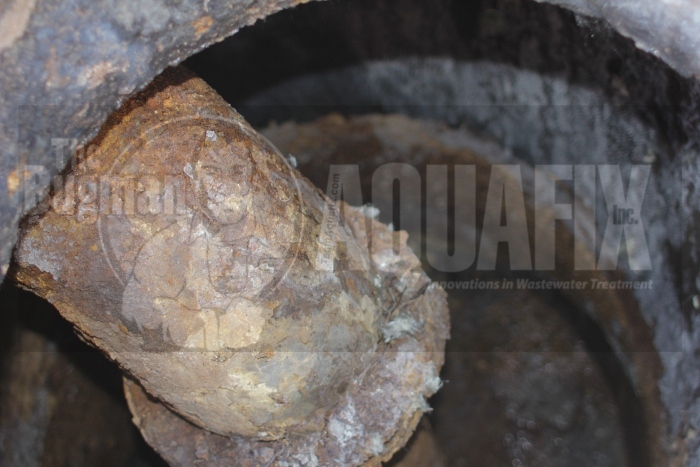 This corrosion is often called Microbiologically Induced Corrosion (MIC) and can rapidly deteriorate cement and iron piping. Hydrogen sulfide is a toxic concern for wastewater operators, especially if odor-masking agents are used, since it can affect the nervous system causing headaches, nausea, irritation of the skin, eyes, and respiratory tract, and at high doses it can cause death (2, 3). The high toxicity associated with hydrogen sulfide is due to its ability to bind to iron centers in mitochondrial cytochrome biocatalysts, which effectively stops cellular respiration and deprives essential organs of energy (3). Although humans do possess biocatalysts in the liver that oxidize hydrogen sulfide to sulfate, high concentrations of hydrogen sulfide will overwhelm biocatalysts (3). For more information see our Hydrogen Sulfide Toxicity Chart. 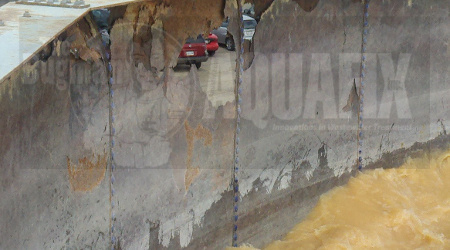 Corrosion of metal and concrete is a major issue associated with the generation and oxidation of hydrogen sulfide. High amounts of sulfuric acid (results from oxidation of hydrogen sulfide by Thiobacillus) lowers the pH of wastewater and contributes to the deterioration of concrete and pipe corrosion (7). Concrete – Concrete is a composite material made of sand, rock, and cement. The cement that locks the sand and rock into place is vulnerable to the effects of hydrogen sulfide and acid attack (5). The rate of concrete corrosion depends on the permeability of concrete and the amount of hydrogen sulfide gas that is adsorbed to the moist sewer walls (8). Signs of prolonged exposure to mild acid attack include rust bleeding, cracking and spalling of the concrete (5). Longer detention and transport distances which increase the amount of septic wastewater. Hydrogen Sulfide can corrode the cement walls of lift stations. 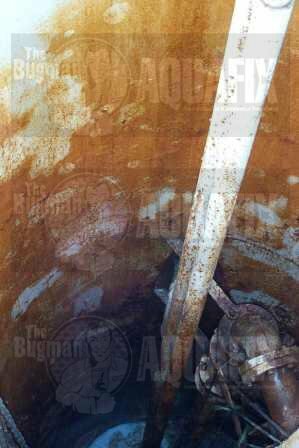 Corrosion makes the walls soft and brittle and can even result in your lift caving in, which is very expensive to fix. Poor settling, excessive sludge production, and corrosion are all results of high concentrations of H2S. In wastewater treatment plants Hydrogen Sulfide can corrode the cement walls around the basin and guardrails. 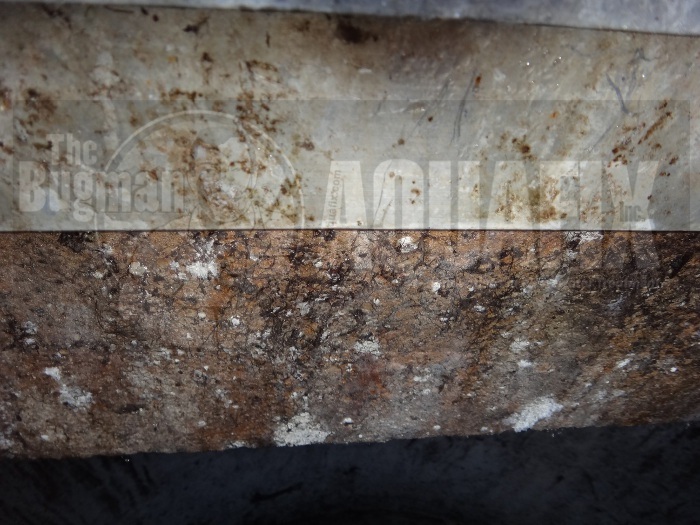 Hydrogen Sulfide not only makes your grease traps smell bad, but it also corrodes the cement walls. Hydrogen Sulfide will make your sludge storage tanks smell bad, but it also corrodes the cement walls and metals leaving holes/pits resulting in unwanted leakage. 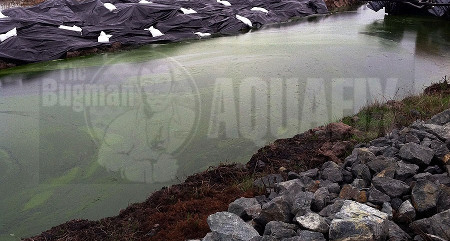 Hydrogen Sulfide makes your lagoons smell bad and your customers upset. It’s caused by the compact sludge forming anaerobic and septic conditions. H2S occurs often in anaerobic digesters. if poor methane generating conditions are present in an anaerobic digester, sulfur-reducing bacteria can out compete methanogens for food, causing an increase in H2S generation. BioGas1: Helps anaerobic conditions favor methanogens over sulfur reducers decreasing H2S and increasing methane. High concentrations of H2S will cause the cement walls to corrode.